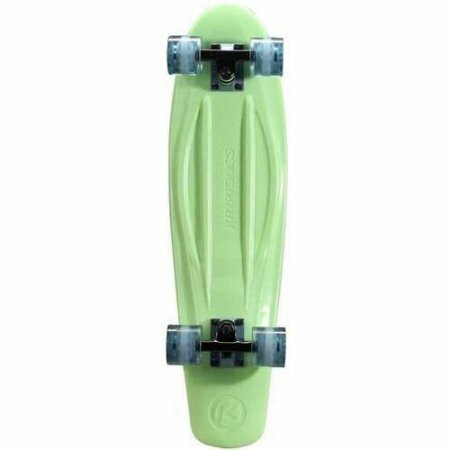 Save 1% on the Kryptonics Torpedo Board Complete Skateboard Carbon steel ABEC 5, 28'' x 7.5'', Pastel Mint by Kryptonics at Kerinci. MPN: 163651. Hurry! Limited time offer. Offer valid only while supplies last. Established in 1965, Kryptonics is one of the most authentic brands in skateboarding and still remains an innovating force in the industry today. Established in 1965, Kryptonics is one of the most authentic brands in skateboarding and still remains an innovating force in the industry today. Kryptonics changed the game in 1976 by developing the first urethane skateboard wheel, and the innovation hasn't stopped since. Kryptonics now dominates the market with a lineup of complete skateboards — including cruisers, longboards, standard 31 in skatepark models and retro poly plastic "torpedo" boards. Every detailed construction of deck, truck, bearing and wheel is considered to reach all age groups and riding styles. Kryptonics completes come fully assembled with grip-tape and skate hardware — make sure to adjust trucks based on skating preference and ability and remove the protective wheel cover which may be installed. Always remember to wear skateboard protective gear (skate helmet, knee pads, elbow pads and/or wrist guards) that supports the rider's skill level. If you have any questions about this product by Kryptonics, contact us by completing and submitting the form below. If you are looking for a specif part number, please include it with your message.